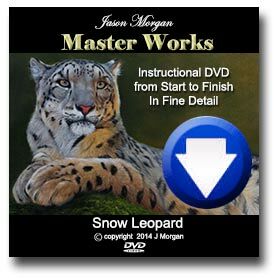 Wildlife Art on Youtube – I’ve just uploaded another video on Youtube, so there are now 4 there. Hope to add some more soon and I also hope you are seeing the paintings develop in a different way. My newsletter has been going for a few years now, but it dawned on me that perhaps some of my Blog readers don’t know about it yet. 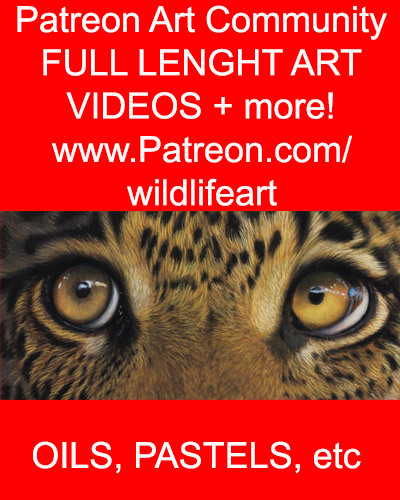 By joining my free Wildlife Art Newsletter you will be amongst the 1st to read about my latest paintings / prints / demos and tutorials plus much more. Never any SPAM, EVER! I guarantee it. New Cheetah Limited Edition Prints Available Now! I’m pleased to let you know that the three new prints have now been released. The cheetah Print also helps conservation with 15% of profits helping cheetah through The Cheetah Conservation Fund. The creative process has already gone through many stages before I even think about putting any paint on the canvas, from actually visiting the animal, whether that be in a wildlife park, private reserve or the wilds of Africa. From there I gather my references and think about the composition, lighting and mood I want to convey. The drawing is then put on the canvas, sealed with a thin acrylic coat and allowed to dry. The 1st layers of paint are merely blocking in, I am however conscience of painting in the fur direction even at this early stage. The main challenge of this stage is to achieve a solid form, one which I can build detail and colour variations upon. At this stage the first blocking in stage is almost complete. I estimate the painting to be approx 40% completed. Absolutely everything will now be adjusted as I bring the paintng to completion. Refining the painting means adding many more layers of paint building upon the under layers (above) increasing the feeling of fur depth. I also glaze areas to give very subtly variations in colour. Below you can see the finished painting.